How much farther will you fall? 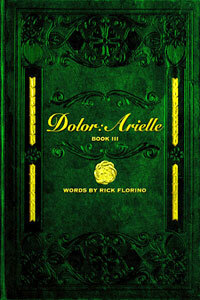 Dolor author Rick Florino is proud to premiere the first three chapters of his latest novel, Dolor: Arielle Book III exclusively here at RFMag.com. In these first three chapters we plunge deep into the world of Dolor, an Anytown, USA riddled with pulse-pounding events and creepy, strange characters. This quick taste is just enough to introduce us to the very human individuals that find themselves wrapped in the seedy underbelly of the town they call home, Dolor. Arielle is the follow up to the critically acclaimed and highly successful Chrissy and Lila stories that first introduced us to this wicked world. Both are available FREE for download at bookofdolor.com. The darkest Dolor yet, Florino’s series has been lauded by Fangoria, The Examiner, Bloody-Disgusting.com, DreadCentral.com and numerous other genre tastemakers as well as Slipknot and Stone Sour frontman Corey Taylor, Hollywood Undead and author Mary Forsberg Weiland. If you dig Stephen King, Dean Koontz, Warren Ellis or Chuck Palahniuk you may find yourself right at home with Dolor: Arielle Book III. Peer into Arielle today and on September 27 download it only bookofdolor.com.